Be EXTRA-ORDINARY! Redemption has freed us to live extra-ordinary lives in response to the resident King. We’re his priests, serving enthroned Glory from close-up. We’ve been liberated from the confines of self-focus to celebrate life in the wide open space of service for the joy and honour of the King. Foundational to this ‘coram deo’ living (before the face of God) is the spiritual communication unique to His redeemed image-bearers. Prayer is more than dutiful routine or a panic button in times of crises. It an enjoyment of God’s company; intimate God-and-us exchanges that fill all of daily living. Prayer is a lifelong journey of learning. The Spirit of Christ has been patiently coaching the church in prayer for millenniums and has more to teach us. 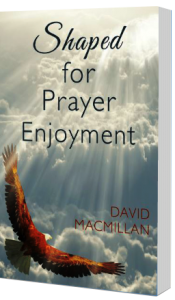 He wants to lead us into the experience of praying that corresponds to the level of Kingdom display written for this exciting chapter of history.